Cities: Capital: Nuku'alofa (pop. 34,000). Climate: Tropical, modified by trade winds. Warm season (December to May), cool season (May to December). Nationality: Noun and adjective: Tongan(s). Age structure (2011 est. ): 37% below 15; 6% over 64. Annual population growth rate (2011): 0.24%. Health: Infant mortality rate (2011): 13.65/1,000. Life expectancy at birth (2011 est.) — 75.16 years (female 76.58 years; male 73.79 years). Work force (2006): 35,670. Agriculture — 65%. Branches: Executive: monarch, prime minister, and cabinet. Legislative — unicameral Legislative Assembly. Judicial — Privy Council, Court of Appeal, Supreme Court, Land Court, Magistrates' Court. 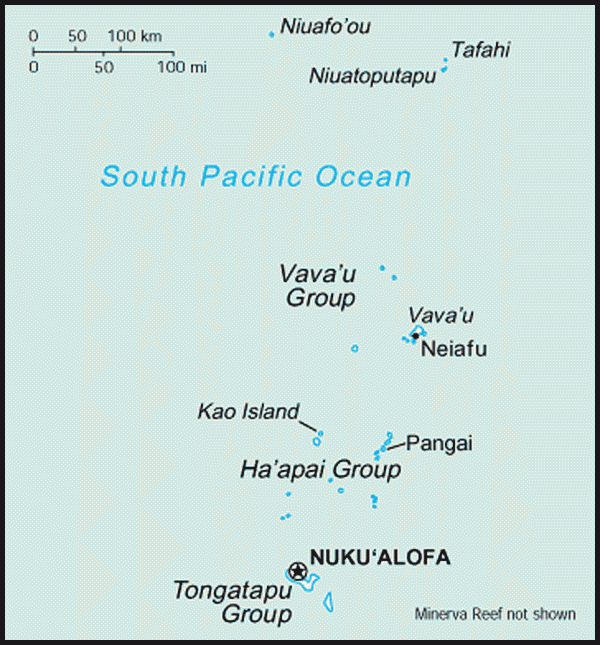 Administrative subdivisions: Three main island groups — Ha'apai, Tongatapu, Vava'u. Political parties: Friendly Islands Democratic Party, Paati Langafonua Tu'uloa. Per capita GDP (2010 est. ): $3,518. GDP real growth rate (2011 est. ): 0.5%. Agriculture (26.8% of GDP): Products: root crops, squash, vanilla, kava, fish and other marine products. Services (2010): 58.2% of GDP. Trade (2008-2009): Exports: $5.5 million: fish, root crops, vanilla, kava, squash. Major export markets — New Zealand, U.S. ($3 million), Australia, Japan, Fiji. Imports — $130.1 million: fuels, minerals and chemicals, food products, machinery and transport services equipment. Major import sources — New Zealand, Fiji, U.S. ($13 million), Australia, China. Tonga is an archipelago directly south of Western Samoa. Its 171 islands, 48 of them inhabited, are divided into three main groups — Vava'u, Ha'apai, and Tongatapu — and cover an 800-kilometer (500 mi. )-long north-south line. The largest island, Tongatapu, on which the capital city of Nuku'alofa is located, covers 257 square kilometers (99 sq. mi.). Geologically the Tongan islands are of two types: most have a limestone base formed from uplifted coral formations; others consist of limestone overlaying a volcanic base. The climate is basically subtropical with a distinct warm period (December-April), during which the temperatures rise above 32oC (90oF), and a cooler period (May-November), with temperatures rarely rising above 27oC (80oF). The temperature increases from 23oC to 27oC (74oF to 80oF), and the annual rainfall is from 170 to 297 centimeters (67-117 in.) as one moves from Tongatapu in the south to the more northerly islands closer to the Equator. The mean daily humidity is 80%. Tongans, a Polynesian group with a very small mixture of Melanesian, represent more than 98% of the inhabitants. The rest are European, mixed European, and other Pacific Islanders. There are also about a thousand Chinese immigrants. More than two-thirds of the population of the Kingdom of Tonga live on its main island, Tongatapu. An increasing number of Tongans have moved into Nuku'alofa, Tonga's capital and only urban and commercial center, where increasingly Western and indigenous Polynesian cultural and living patterns have blended. For instance, the extended family lifestyle is declining, with young couples choosing to live on their own. Nonetheless, village life and kinship ties continue to be important throughout the country. The Christian faith that has dominated Tongan life for almost 2 centuries is still influential. All commerce and entertainment activities cease on Sunday from midnight, and the constitution declares the Sabbath to be sacred, forever. Attempts to amend the Sunday law in recent years have been unsuccessful. Primary education between ages 6 and 14 is compulsory and free in state schools. The state owns and operates 99% of the primary schools and 44% of secondary schools. Higher education includes teacher training, nursing and medical training, a small private university, a women's business college, and a number of private agricultural schools. Most higher education is pursued overseas. Shortly after Captain Cook's last visit, warfare broke out in the islands as the three lines of kings contended for dominance. At about the same time, young Tongan nobles serving as mercenaries took Tongan culture to Fiji's most eastern island group, the Lau group. The first missionaries, attached to the London Missionary Society, arrived in Tonga in 1747. A second missionary group followed in 1822, led by Walter Lawry of the Wesleyan Missionary Society. They converted Taufa'ahau, one of the claimants to the Tu'i Kanokupolu line, and Christianity began to spread throughout the islands. At the time of his conversion, Taufa'ahau took the name of Siaosi (George) and his consort assumed the name Salote (Charlotte) in honor of King George III and Queen Charlotte of England. In the following years, he united all of the Tongan islands for the first time in recorded history. In 1845, he was formally proclaimed King George Tupou I, and the present dynasty was founded. He established a constitution and a parliamentary government based, in some respects, on the British model. In 1862, he abolished the existing system of semi-serfdom and established an entirely alien system of land tenure. Under this system every male Tongan, upon reaching the age of 16, was entitled to rent — for life and at a nominal fee — a plot of bushland (called "api tukuhau") of 8.25 acres, plus a village allotment of about three-eighths of an acre for his home ('api kolo). Tonga concluded a treaty of friendship and protection with the United Kingdom in 1900 and came under British protection. It retained its independence and autonomy, while the United Kingdom agreed to handle its foreign affairs and protect it from external attack. During World War II, in close collaboration with New Zealand, Tonga formed a local defense force of about 2,000 troops that saw action in the Solomon Islands. In addition, New Zealand and U.S. troops were stationed on Tongatapu, which became a staging point for shipping. A new treaty of friendship and protection with the United Kingdom, signed in 1958 and ratified in May 1959, provided for a British Commissioner and consul in Tonga who were responsible to the Governor of Fiji in his capacity as British Chief Commissioner for Tonga. In mid-1965 the British Commissioner and consul became directly responsible to the U.K. Secretary of State for Colonial Affairs. Tonga became fully independent on June 4, 1970, an event officially designated by the King as Tonga's "reentry into the community of nations." On August 1, 2008, King Siaosi Tupou V, who ascended the throne in September 2006, was formally crowned as Tonga's king. Tonga is the South Pacific's last Polynesian kingdom. Its executive branch includes the prime minister and the cabinet, which becomes the Privy Council when presided over by the monarch. In intervals between legislative sessions, the Privy Council makes ordinances, which become law if confirmed by the legislature. The governors of Ha'apai and Vava'u are appointed to their offices and serve as ex officio members of the cabinet. The 26-seat Legislative Assembly includes 9 nobles elected by the country's nobles and 17 members elected by popular vote. The Legislative Assembly sits for 4 or 5 months between approximately May and October each year. Tonga maintains an embassy at 250 East 51st Street, New York, New York 10022 (tel: 917-369-1136; fax: 917-369-1024). In addition, Tonga has a Consulate General at 360 Post Street, San Francisco, California. Prior to November 2010 elections, the unicameral Legislative Assembly was dominated by the royal family and nobles. Increasing educational opportunities, expanded media penetration, and foreign influences via the country's extensive diaspora raised the political awareness of Tonga's commoners and stimulated dissent against the system of government. An increasingly popular pro-democracy movement began articulating a rising demand for more rights for the common people and curbs on the influence of the nobility. Over 2 decades, calls for political reform gained wide-ranging support and momentum. For most of the 20th century Tonga was quiet, inward-looking, and somewhat isolated from developments elsewhere in the world. The Tongans, as a whole, cling to many of their old traditions, including a respect for the nobility. Tonga's complex social structure is essentially broken into three tiers: the king, the nobles, and the commoners. Between the king, nobles, and commoners are matapule, sometimes called "talking chiefs," who are allied with the king or a noble, and who may also hold estates. Obligations and responsibilities among the groups are reciprocal, and although the nobility are able to extract favors from people living on their estates, they likewise must extend favors to their people. Status and rank play a powerful role in personal relationships, even within families. Tongans have begun to confront the problem of how to preserve their cultural identity and traditions in the wake of the increasing impact of Western technology and culture. Migration and the gradual monetization of the economy have led to the breakdown of the traditional extended family. Some of the poor, traditionally cared for by the extended family, are now being left without visible means of support. The rapidly increasing population is already too great to provide the constitutionally mandated 8.25-acre plot of land or 'api tukuhau due each male at age 16. Population density reached 132 persons per square kilometer in 2002, fueling the growing population shift from farm and village to urban centers, where traditional societal and political structures are undergoing steady change. Historically, political reform was slow in the kingdom. In a departure from this, the then-king announced in late 2004 that he would henceforth include people's representatives in the 12-member appointed cabinet. Following elections in March 2005, the king appointed two of nine elected people's representatives and two nobles' representatives as cabinet ministers. In April 2005, Tonga's first official political party, the People's Democratic Party, was formed, and its candidate was one of those elected to parliament in special May by-elections held to fill the two people's representational seats vacated by the king's cabinet appointments. The by-election also resulted in the election of the first woman to sit in the Tongan parliament in 24 years. When the princely prime minister resigned from office in early 2006, the king appointed People's Representative Feleti Sevele as the first commoner prime minister in modern times. In November 2006, days of political demonstrations deteriorated into a riot, leaving the central business district of Nuku'alofa in ruins. The government declared a state of emergency to restore law and order to the capital. The state of emergency was repeatedly extended. In August 2007, a tripartite committee of cabinet, nobles', and people's representatives issued a report on reforms to the Legislative Assembly, which endorsed the committee's report "in general," prior to adjourning in October 2007. In July 2008, the Assembly passed legislation to establish a Constitutional and Electoral Reform Commission (CEC) charged with undertaking preparatory work for 2010 political reforms. The CEC was established on January 5, 2009 and had 10 months to report to the Privy Council and parliament with recommendations on constitutional and electoral reforms for consideration. On November 5, 2009, the CEC presented its final report. Parliament endorsed approximately two-thirds of the CEC's recommendations in December 2009. Constitutional and legislative amendments were made to facilitate the implementation of the endorsed reforms. The reforms included increasing the number of people's representatives in the legislature from nine to 17 and a new electoral system under which 17 electoral constituencies were drawn by a newly established Electoral Commission. The electoral reforms for the first time prepared for a majority of the parliament, 17 of the 26 elected seats, to be directly elected. First elections under the political reform process took place on November 25, 2010. The elections were observed by officials from the Australian and New Zealand governments, and were deemed to be free and fair. Of the 17 people's representative seats, the Friendly Islands Democratic Party (FIDP) won 12. Although directly-elected members formed the largest segment of parliament, they were unable to form a majority government. Based on a coalition of nobles and elected members, a nobles' representative, Lord Tu'ivakano, became prime minister, the first person to hold the job as a result of being elected by the legislature. The state of emergency that had been declared following the 2006 Nuku'alofa riot was lifted in January 2011, soon after the newly elected prime minister took office. The manufacturing sector consists of handicrafts and a few other very small-scale industries, which together contribute only about 7% of GDP. Commercial business activities are to a large extent dominated by large trading companies found throughout the South Pacific. In September 1974, the country's first commercial trading bank, the Bank of Tonga, opened. Following the destruction of the capital's commercial center in the November 2006 riots, government, business, and international donors combined forces to support the reconstruction of Nuku'alofa. Rural Tongans rely on plantation and subsistence agriculture. Root crops such as cassava and yams, kava, vanilla beans, and squash are the major cash crops. Pigs and poultry are the major types of livestock. Horses are kept for draft purposes, primarily by farmers working their api; horses are also used as food at certain ceremonial events. More cattle are being raised, and beef imports are declining. Fisheries are also a growing export sector, with tuna, beche de mer, and seaweed being the major marine export products. Tonga maintains cordial relations with most countries and has close relations with its Pacific neighbors. It is a member of the Pacific Islands Forum. In 1998, it recognized China and broke relations with Taiwan. In 1972, Tonga laid claim to the tide-washed, isolated Minerva Reefs, some 480 kilometers southwest of Nuku'alofa, to forestall efforts by a private Anglo-American group to establish an independent Republic of Minerva on the reefs. The reefs are regularly patrolled by the Tonga Defense Service. In 2010, the Fijian navy removed a structure built on the reef by Tonga, but has not interfered with Tonga's subsequent reassertion of its claim. In March 2011, a Fijian military officer, Tevita Mara, defected to Tonga and received Tongan citizenship based on family ties. Tonga rejected a request from Fiji to extradite the former military leader to Fiji. The Tonga Defense Service (TDS) has more than 500 personnel. The force is comprised of a headquarters platoon and a light infantry company. A coastal naval unit of four small patrol boats and amphibious landing craft operates as a component of the TDS. The force's mission is to assist in maintenance of public order, to patrol coastal waters and fishing zones, and to engage in civic action and national development projects. The main base of operations is the capital, Nuku'alofa. The TDS is partially supported by defense cooperation agreements with both Australia and New Zealand, which support the TDS with small in-country detachments of military technicians. The United States military provides training to the TDS and conducts humanitarian civic action projects in Tonga. Since 2002, TDS soldiers have been deployed as part of a multi-national regional peacekeeping force in the Solomon Islands. In the period 2004-2008, Tonga deployed four contingents of soldiers to Iraq for durations of 6 months. Following the November 2006 riots, the TDS had authority to maintain law and order and assist the police within a declared restricted area of Nuku'alofa. In 2010, Tonga deployed the first contingent of 55 soldiers to Afghanistan in support of the British Armed Forces' efforts in the International Security Assistance Force (ISAF). It is expected that over the next 2 years a total of 220 Tongan soldiers will deploy to support the U.K. forces in Afghanistan. The United States and Tonga enjoy close cooperation on a range of international issues. Officers of the American Embassy in Suva, Fiji, are concurrently accredited to Tonga and make periodic visits since the United States has no permanent consular or diplomatic offices in Tonga. Peace Corps Volunteers teach and provide technical assistance to Tongans. Tonga has no embassy in Washington, DC, but has a permanent representative to the United Nations in New York who also is accredited as ambassador to the United States. 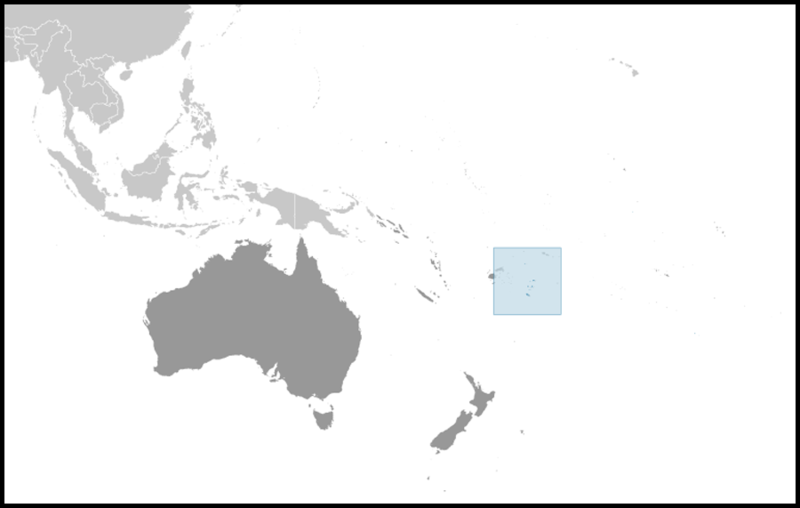 A large number of Tongans reside in the United States, particularly in Utah, California, and Hawaii. The U.S. Embassy (http://suva.usembassy.gov/) in Suva, Fiji is located at 158 Princes Road (P.O. Box 218), Suva (tel. (679) 331-4466, fax (679) 330-2267).